I got it this past January and I have used it all spring until present. It is a great quality kayak which tracks really well and can be loaded/unloaded and muscled around by myself. Very stable and maneuverable. You will really be impressed with this one! This is my 3rd kayak that I've owned and I've tested out several others as well. By far, this has been my favorite one & I doubt I'll ever have to purchase an other now! Tracks well, plenty of room for all my gear, and it's not too heavy for loading & unloading on J racks. It was a great purchase and was exactly what I was looking for. It is very stable and comfortable. Kayak arrived in good condition. No issues with the delivery at all. The customer service folks at ACK were in phone contact with me a number of times giving me updates on delivery. My only complain is when I ordered the kayak it was listed on the website as in stock. This turned out not to be the case. I had to wait an extra three or four weeks but that wasn't a big deal. I've had this kayak for a full summer and have kayaked on big and little lakes and some streams here in Oregon. I am 6'2" and 200 pounds. This is my 3rd kayak and an upgrade from the Lifetime Tamarak Angler. The seat is by far the most comfortable of any kayak I've used. At only 57 pounds it's easy to handle and load on top of my car. A lot has been made of the poorly designed molded rod holders but it's a non-issue since I use a milk crate with multiple rod holders. The plastic tracks also work just fine. I thought I would replace them with metal ones but that's not necessary. They are much sturdier than I at first thought. I love how the kayak tracks on the water and the 2 seat positions (high and low) gives you 2 different paddling experiences. I prefer the low seat position as I feel like I have better leverage and a more comfortable sitting position. I also really like how the kayak looks (I have the green moss color). I was fortunate to buy this on sale for $645 (or close to it). I discovered that foam golf balls make great scupper plugs that never have to be removed and I particularly like Cabelas quick-draw rod holder. I'm super happy with this kayak and in a few years might get the Pilot (peddle version). A Great Kayak. Very Stable and the rails are nice to have. Plenty of room to carry a cooler, tackle, and much more with you. Very easy to get in and out of as well. I would buy again for sure. Our Perception Pescador Pro 100 Kayak arrived via Estes freight yesterday in excellent condition. Austin Kayak is such a great company, very professional staff and great customer service. We took our yaks out for the first time today. Very satisfied with our purchase. Great for fishing or recreational use. Comfortable seat, and all the features I was looking for. Very stable and tracked well for the 10.5ft length. Easy to handle and get to the water with its light weight. Great quality kayak for the price. Great kayak for fun or for fishing! Very stable. Comfortable and wide seat. Easy handles for carrying and moving the kayak. 10.5 feet is a great length. Blue color is beautiful and I bought a paddle to match the yellow. Box in the middle is a little narrow but holds a few items. I would definitely recommend. Shipping took about 1.5 weeks. Was a little confusing but I think it's because it was shipped on a holiday weekend so the dates got all messed up and the shipping company was confused. I researched SOT fishing kayaks for almost a year before I purchased this one and I am very satisfied with my choice. It is light weight, stable, and tracks extremely well for a 10' kayak. I am 6' 2" and weigh 225 and this kayak is plenty roomy and comfortable. I am 56 years old and I can stand and fish without too much trouble. Although an assist strap would be nice. My only concern is the plastic track holding out. I am in Minnesota and I will fish off this thru early winter on the river and I am concerned it may crack when it gets cold out. We shall see. Austin Kayak has great customer service, their shipping company was fantastic and quick. I would highly recommend this inexpensive, top quality, light weight, easy to handle kayak, and ACK, to anyone!!! This was my first fishing kayak and I was really stuck between the Pescador Pro 10 and the FeelFree Lure series. I actually had a chance to try out both the 10.5 and 11.5 Lure and needless to say, they were stable but slow. When I received this package, they did a great job of wrapping it up and everything went smooth in terms of the delivery process. Now, when I took out the kayak for the first time, I went to a local lake and needless to say, I LOVE IT! The only cons I would say about the boat are: 1) It takes some time to get used to the stability while standing, but while sitting, it is perfect. The chair is very comfortable and I believe I will be able to spend long hours in it. 2) The rod holders that are already preinstalled are pretty bad, I wouldn't recommend putting anything in there, unless you just need a temporary place to put something. 3) The geartrac's are kind of cheaply made. Anyway, onto the good things about this kayak. 1) It is a REALLY portable kayak. I am only 5'7, 120 Pounds and I have no problem loading this thing by myself. I can actually pick the kayak up by its side, no need to drag it. In. 2) It is a quick kayak. I was able to maneuver pretty quickly and was also able to turn on a dime whenever I needed to. Although, the wind does make it a little tough to stay on a consistent path. Overall, it is a great kayak and I am glad I saved about 500 dollars to go with this one. It is worth the price and there isn't really any reason to get a more expensive kayak, unless you are REALLY BAD with stability. SAVE YOUR MONEY AND GET THIS KAYAK! IT IS JUST AS GOOD. My husband already had the kayak out 2-3 times already and he loves it! Bought the Pescador Pro about a month ago. It was my first kayak so I can't compare to others. But seems to track amazing, turns easy, and is very stable. Have only taken it out on lakes, even with 25mph wind and choppy water I never worried about tipping. Attached an anchor trolley and better fish holders and love my kayak. The molded in holders are very shallow so if you put poles in them just make sure they are attached to a leash. Austin kayak had awesome customer service and the kayak was here in less than a week. Delivered in great condition. Great kayak! It has plenty of room for me and i am 6'1" 170lbs. This boat tracks good and is quite fast for how wide it is. The seat is awesome! Also it can hold quite a bit of gear. Two thumbs up in my book. Great kayak! it has plenty of room for me and i am 6'1" 170lbs. This boat tracks good and is quite fast for how wide it is. The seat is awesome, super comfortable. Also holds quite a bit o gear. Actually I'm very impressed. I bought the Pro 100 because I wanted a lighter, slightly less expensive kayak. Not only is it light, its very stable and fast !!! It'll also turn on a dime. Perception hit a homerun with this one ! Awesome Kayak and very sturdy for a 10 foot yak. I purchased about a month ago. I have taking this bad boy up streams, creeks and rivers with ease. Live in Ohio and could NOT find a better deal then ACK offered. Free shipping and ACK customer service is above and beyond. This yak was out of stock at purchase time but they called and let me know immediately. They informed me it would be two weeks and if I was OK waiting. This was very much appreciated they reached out to me without me having to wonder where my new Kayak was. ACK has a customer for life. This is how a business should be run. Thank You ACK. Love my new Kayak and very much pleased with ACK. Great kayak for a great price. One time out and so far I'm happy. Rock solid construction and light enough to carry. The seat is very comfy. Downsized from a 14.5 Ultimate and this is much easier to move around on dry land and car top. I'm 300 pounds and knew the weight was pushing the 325 capacity. It paddles fine and stable in either seat height position. The water comes up to level with the cockpit in the scupper holes in the tank well and footwell. I bought the universal scupper plugs and put them in the seat well and foot well. They work well. I'm happy with the boat for the price and ease of use to get out on the water and paddle and occasionally cast a line. Bought 10' and 12' Pescador Pro on the 15% off sale. Good service from ack. Rigged trolley with no drilling. Very nice system. If your interested i can send u pics. I copied some of it from another post. I love this kayak! I got this kayak for my 12th birthday. This is the first fishing kayak I've owned and love it! The kayak is super stable and plenty wide. I'm glad I went with the 10 ft. Version, it has plenty of room for all my fishing gear. Seat is very comfortable! I love the dry storage also. This is the best all around kayak for the money. I recommend Austin Kayak Co. They have great customer service and appreciates your business. You can't go wrong with Perception. Nothing I would change about the Perception Pescador Pro 100! I highly recommend this kayak!! This was my first kayak purchase, but so far I'm very impressed. Well designed, especially the recessed transducer slot in the bottom of the hull. The seat is very solid and comfortable and the accessory tracks work great with Railblaza products. This is also a great looking kayak. After comparing this kayak to other makes/models, I think it's a great value for anyone looking for a fishing kayak with nice features at an affordable price. Very stable, super comfortable. I can fish all day in this yak!!!!! Tracks well, fast. I got the 10' and there is plenty of room. I can carry it like a briefcase. It's everything I need. 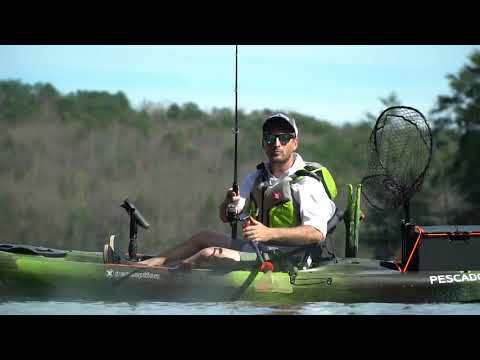 If you don't fish, don't overlook this one for a recreational kayak. Under priced... made in the USA too.....SWEET!!!!!!!!! Had several SOT kayaks over the years. The Pescador Pro included the best features of all my other ones. I use exclusively for fishing, lakes, rivers, streams, and close off-shore. The elevated seat is a must for the back if you plan on being out for any length of time. Very similar to my Old Towne Predator only shorter, making it more protable, and HALF the price. For a short yak, it tracks and paddles well. Good manueverability, very stable. Be nice if it came with self baling scuppers! After months of searching sitting in researching and video watching, this was the one for me. I wanted the openness of a sit- on-top but the portability of a sit-in so i didnt want a huge 12' or more. I wanted to fish out of and still have a nice adventure paddler that tracks well and stable without sacrificing speed. Layout was high but seating was most important for long days on the water and this one has the best of all others i have seen. Quality of course is also a factor along with price, the perception line as a whole has a very good track record for these qualifications so it didn't disappoint on arrival. ACK shipping people did a excellent job packing. Great kayak! I didn't know how much I would like this boat. After seeing the price I asked myself; what's wrong with it? what's it lacking? After using it I must say this is a good all around boat. Tracks well. Turns on a dime. Has all of the things you would expect from a high end boat without the high end price. I had every intention of buying a $1700 boat but I'm glad I didn't. There aren't any pictures of the transducer scupper. The transducer scupper is recessed on the underside so it's completely protected from whatever you might bang the bottom of the boat into. Buy this boat and you won't regret it. A: This kayak is 32" wide and relatively stable. You could stand up in it, but it would depend on the water conditions and your balance. Q: Hi- Looking to buy my first fishing kayak and I'm torn between the Pescador Pro 10 and the 3 Waters Big Fish 105 . If you had to choose one , what would it be for you? A: I would personally go with the Pescador Pro over the Big Fish. Q: Can you get a replacement seat for this kayak? A: We can special order the seat from Perception. Give us a call or send us an email to set up an order! Q: Does the seat on the pescador pro 10 able to be set up high and low position. Besides upright and recline. A: This does have two different molds to be able to put into a high and low spot. A: The rear tank well is 27.5 inches long x 18 inches wide. It will hold the yak gear milk crate, but may be hard to fit under the bungee. Q: What is the length of the gear track? What would you recommend to order to reinforce/replace it if it isn't sturdy enough? A: The gear track replacement for this kayak is going to be the Harmony Pescador Pro GearTrac- 12 in. This will be the only option on the Pescador pro 10. Q: Do they make replacement seats for this kayak? A: We can always order them for you if you need. Q: I have a perception access 115 and I'm considering the pescador pro 10. I am 6 ft tall is there enough leg room in the pro 10 for me? A: The Pescador Pro 10 is going to have ample leg room for someone that is 6' tall. Q: What scupper plugs do you use for the Pescador 10 Pro? Also is there a discount code to use to get a discount? Q: is there space to store rods underneath or no? Q: I just bought the Pescador Pro 100 and see that it is ready for fish finder installation. Was it supposed to come with the Ready Cover Plate for the transducer scupper? It didn't......where do I get one? And is the Hobie Lowrance Ready Cover Plate universal and work with the Pescador? A: The Pescador Pro does not come with a Ready Cover Plate. I would recommend a flexabile RAM arm mount for the transducer. A: I like the Pescador a lot. Its a good boat for what you are looking for. It will be easier for you to maneuver as well. Q: Is this a 2016 model? What transducer to you recommend be used with the tunnel mounted Fish Finder? Q: Does the Lowrance scupper mount work well with the scuppers in this kayak? A: Thank you for your question! While it is possible, it will not be the best fit and we do not recommend it. Q: I am interested in the Perception Pescador Pro 10 kayak or the Wilderness Systems Tarpon 100 for my fifteen year old son.. I'd like to get him something he could use for fishing and kayaking. There are many more reviews for the Tarpon 100, and wondered if you'd recommend one over the other? A: Both kayaks are extremely popular among paddlers and avid anglers. The advantage of the Tarpon is the Orbix hatch and the seat. The Pescador Pro does come with a high low position seat which is very comfortable and has a more attractive price.